For two decades, the Gold American Eagle coin program consisted of a bullion version aimed at investors, and a proof version aimed at collectors. While both coins proved popular among investors and collectors alike, the US Mint introduced a new version to the series in 2006. The burnished coin features a stunning finish designed for those looking to display or exhibit their coins. Today, the 2015-W 1 oz Burnished Gold American Eagle is available through Silver.com. Extremely limited availability in this grade and series! Face value of $50 (USD) is backed by the federal government. Issued a perfect grade of Mint State 70 by the Numismatic Guaranty Corporation. Struck with a “W” mint mark at the West Point Mint. On the 20th anniversary of the Gold American Eagle coin series, the United States Mint unleashed a brand-new version of the coin. The Burnished Gold American Eagle features a brilliant finish that surpasses that of standard proof coins. Each of these coins is the result of a unique coining process. US Mint coin press operators hand load burnished blanks into the coining press, and strike each one multiple times with a die to create the stunning finish. Each of the 2015-W Burnished Gold American Eagles in this product listing is in perfect condition. Each has its full, original luster, and has no blemishes or detracting flaws of any kind. As part of the Early Release Series, these coins were received by the NGC during the first 30 days of their release. Augustus Saint-Gaudens’ iconic Lady Liberty image is featured on the obverse side of each coin. His image was first featured on the $20 Gold Double Eagle, struck for the first time just months after his death in 1908. Sculptor Miley Busiek was commissioned to create the bald eagle imagery on the reverse of these coins. If you have any questions for a Silver.com associate, don’t hesitate to call us at 888-989-7223, chat with us live, online, or send us an email. 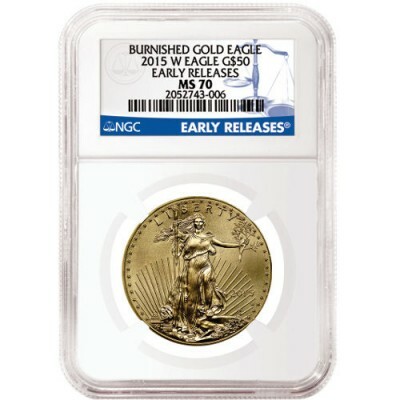 If you are interested in similar products, be sure to check out our full selection of Gold American Eagles.